This incredible girl needs a special someone - she needs a home now! When you send your foster kittens out into the world, you hope only for the best home, but that's not always the case. Nico was not only declawed after being adopted but likely hit by her adopters - she is very hand shy and runs from loud voices - so it was likely a noisy, intolerant possibly abusive home. Then she was dumped back at the shelter after 3 years. Nico ended up on the euthanasia list at the KS Humane Society for biting a staff member. I can only say I'm thankful that they still had the paperwork listing me as her foster. Of course I zoomed over to get her. Biting is the only defense a declawed cat has, and since the shelter is overcrowded, no exceptions are made. The shelter is noisy, hectic, strange-smelling and was a traumatic place for her. So I understand the bite. I got a bite early on, as well (full disclosure) when she first came back to me. This is why they say to never use your hands as toys with a kitten. It almost cost Nico her life. Nico is now enrolled in Tammey's School for Wayward Cats. I have been working with her daily, helping her to overcome her hand shyness. She now eagerly takes treats from my fingers with a very delicate touch. I'm so proud of her! Over the weeks, she has come to trust me. There's nothing that compares to engendering trust in an animal - especially a cat. Her cute personality is really showing now. I hate that she's relegated to my bathroom, but all my visits start with her leaping into my lap, at her insistence. What a snuggler she is! - rubs, purrs, hugs, butts, repeat until she settles in for a lap nap. Every adventure out of the bathroom starts with her little quirky habit - instead of kneading with her front paws like most cats, she stands in place and marches with her back feet while shaking her tail - doing a happy dance. Typically this is a sign of slight overstimulation (opening the bathroom door to a new world), but I have to admit it's quite cute watching her march in place. She likes to chit chat with you. She's got great eye contact. She's a smart one, so you'd swear she understands every word you say to her. She's a great listener! Her ideal home would NOT include children or visiting youngsters. It's just not worth risking her life again. 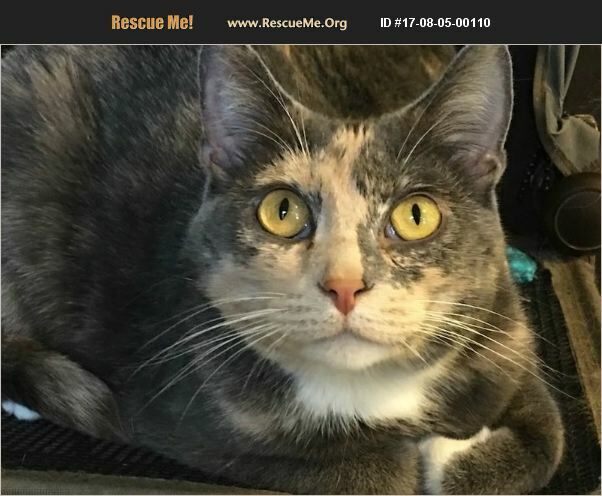 Someone who knows that a good helping of patience and time will result in a wonderful relationship with a beautiful, 3 year old dilute calico cat. She can learn to trust again. She's done it with me. But she can't stay in my bathroom forever and she's honestly not fond of other cats - so my 7 residents would not be a good fit for her whatsoever. She might accept a kitten, but considering her background, why complicate things with trying to not only give her a comfortable home with making her get along with another cat? She bonds to her humans. You'll have to start slow with Nico with few expectations initially. I know from the time I've spent with her, she absolutely has it in her to be a nice lap cat and an engaging companion. She may always be a little frightened by loud noises and quick movements, so a quiet home would be best. I will include the cat tree that she calls home right now. It hangs on the back of my bathroom door and that's her comfort zone currently and serves as a hideaway from what scares her. So to conclude�'�| Nico is 3 years old A Dilute Calico with cute white paws and chest Spayed Weighs around 9 lbs Front Declawed (grrrrrr) Microchipped Vaccinated Perfect litter box habits - must use soft litter for a declawed cat. Loves her crunchies and will eat canned cat food if it's got tuna in it Loves her cat tree (included) Does NOT love other cats Loves laps Loves catnip Loves to explore (as long as she's got her cat tree to run back to when startled) Loves to stand on her head when you pet her Loves to talk to you Loves her primary caregiver and will bond tightly, but is fine with being left alone for awhile too - she's not clingy - just very affectionate. About her name - she wasn't originally called Nico - she's not used to it, so you can rename to whatever your heart tells you. I will travel up to 200 miles to meet &/or deliver to the right home. I adore her but I'm not her ideal home. I've already got every spare room in my little house devoted to one resident cat or another. Please send me a private message with your phone number or with questions. Please help spread the word that Nico needs a new lease on life. She almost lost hers. This time it will be a good one. Please, someone, help her trust again. Thanks for caring.